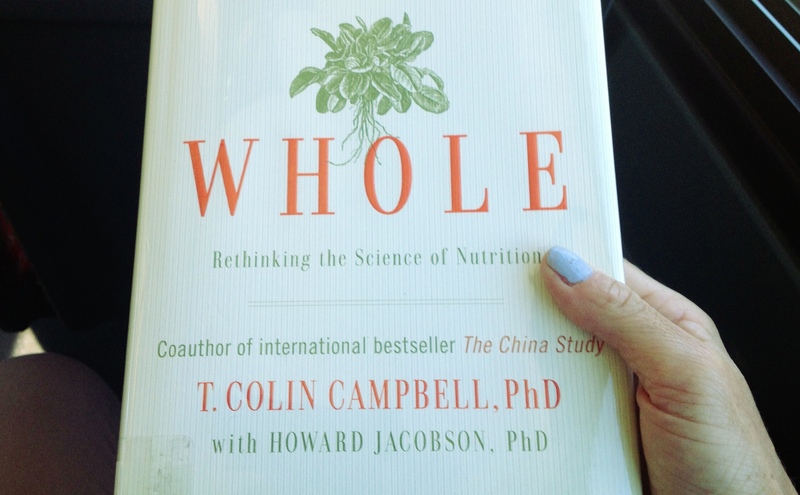 Dr. Campbell, in the follow up to his book, The China Study, discusses the implications of a Whole Food Plant Based (WFPB) diet to research, social policy and healthcare. The China Study was a cross-sectional ecological design that found that higher consumption of animal products in different regions of China was correlated to greater the incidence of and mortality from cancer, heart disease, stroke etc. His central thesis is around the contribution of poor nutrition (nutritional imbalance) to cancer occurrence, or disease occurrence in general. Specifically, he states that a high protein diet increases MFO enzyme activity, leading to increased binding of toxic metabolite (AF) to DNA, causing more cancer. He empowers us to have control over our health through the simple act of choosing what we eat. Dr Campbell states the current medical system focuses exclusively on treating symptoms, and steadfastly ignoring the root causes. He believes the power of WFPB diet to act harmoniously on a broad variety of illnesses and that poor nutrition causes more disease than the “disease-care” system currently acknowledges. He emphasizes that whole foods are astoundingly more potent as the same amount of isolated vitamins and supplement. This is because compounds in foods work together to be more effect in context of the whole than when in an isolated pill. As such, we don’t necessarily know how much of these vitamins and minerals we are getting from the food we eat… but that doesn’t matter because the body is smart enough to take what it needs from the foods we eat (even plant-based protein!) and waste the rest! How smart ?! … some food for thought! much love. Amanda, accompanied by her new-found sadhu friend Devi Das, works her way through India and spiritual teachers, like Mr Kapoor, Hari Das, Sri Satyaji, and finds herself in a variety of situations with the purpose of “being enlightened”; yoga classes, silent meditation, being blown on by female avatars, watching death ceremony’s at the foot of the Ganges, tantric gatherings, at the bodhi tree of the buddha’s enlightenment, and caves in snowcap mountains. 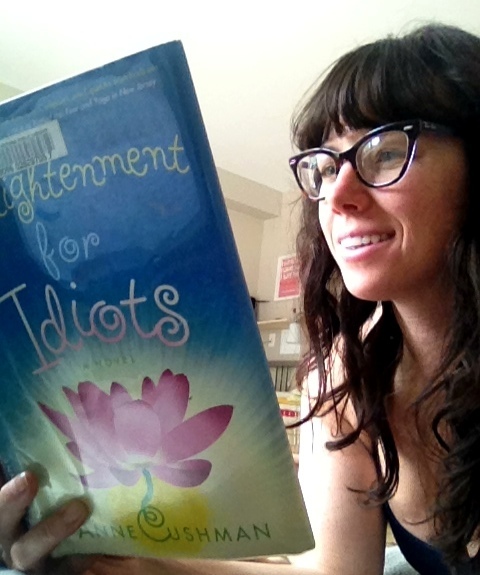 … a fun, summer read that helps you realize that enlightenment is here too, all around you, and everything’s ok. much love. 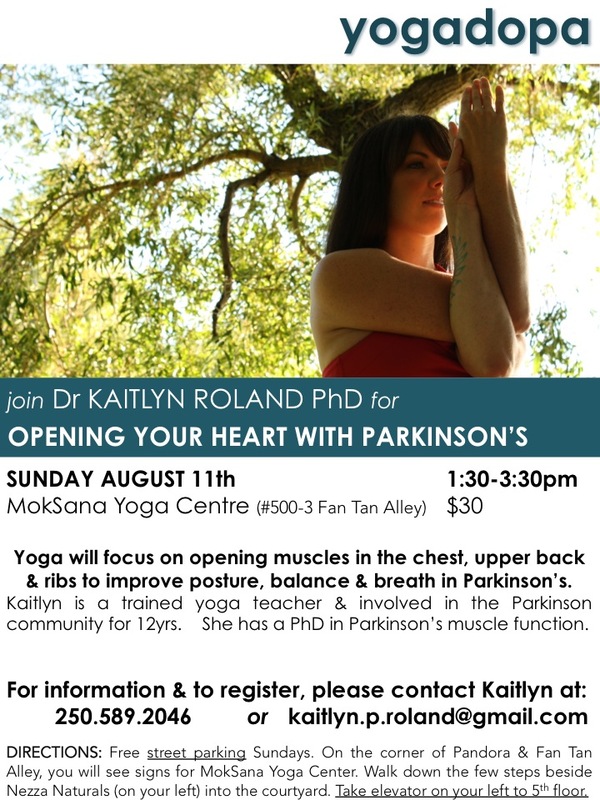 If you live in the victoria area, join me on August 11th for my next yoga workshop for Parkinson’s at Moksana yoga centre. We’ll focus on targetting the muscles of the upper back and opening the chest. Specifically the postures will help address stooped posture and postural instability, creating more space in the upper body. Please contact me at: kaitlyn.p.roland@gmail.com or 250.589.2046 to register or for more information. –Looking forward to seeing you there! much love. A prion is thought of as a protein molecule with no genetic material that can infect, multiply and kill. 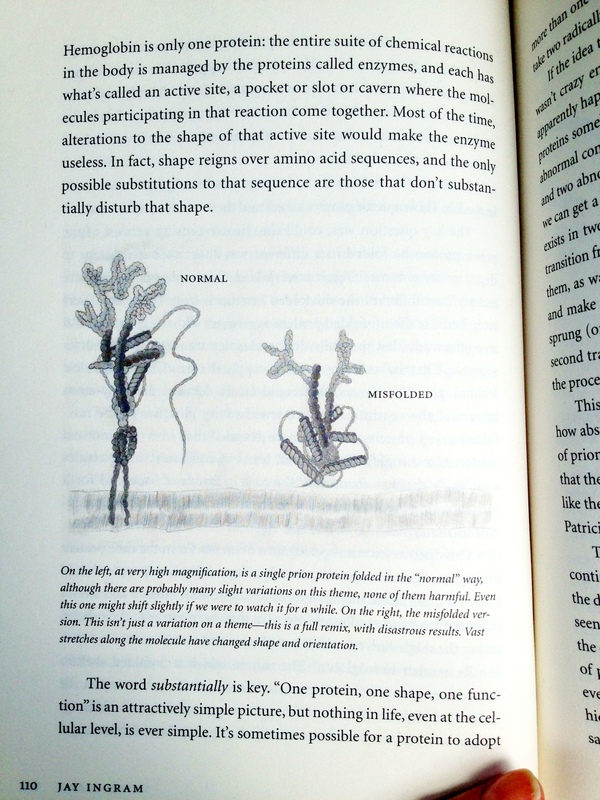 Prions are caused by misfolded ‘normal’ proteins and were “discovered” by Stanley Prusiner (who won a nobel prize). 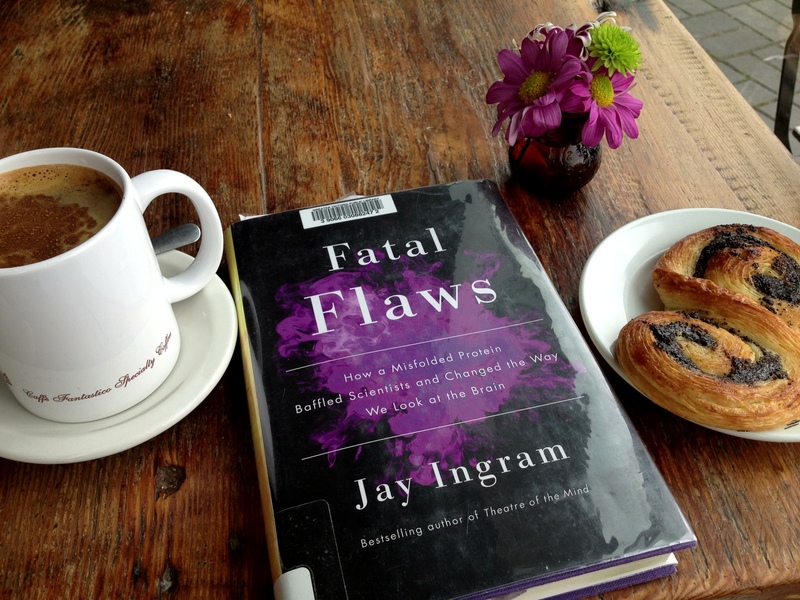 I recently read Fatal Flaw by Jay Ingram (of Daily Planet and Quirks & Quacks), “the rough and tumble story of prions, filled with rivals, eccentrics, meddlesome governments and brilliant creatives“. As I sat down with my coffee and danish, I started to read about cannibalism in New Guinea and a disease “Kuru”. How appetizing. This book tracks prion disease from kuru (thought to be caused by cannibalism of prion-diseased brains), scrapie in sheep (spongiform encephalopathy), related to bovine spongiform encephalopathy (mad cow disease), chronic wasting disease in North American deer, and finally to Creutzfeldt-Jakob disease. 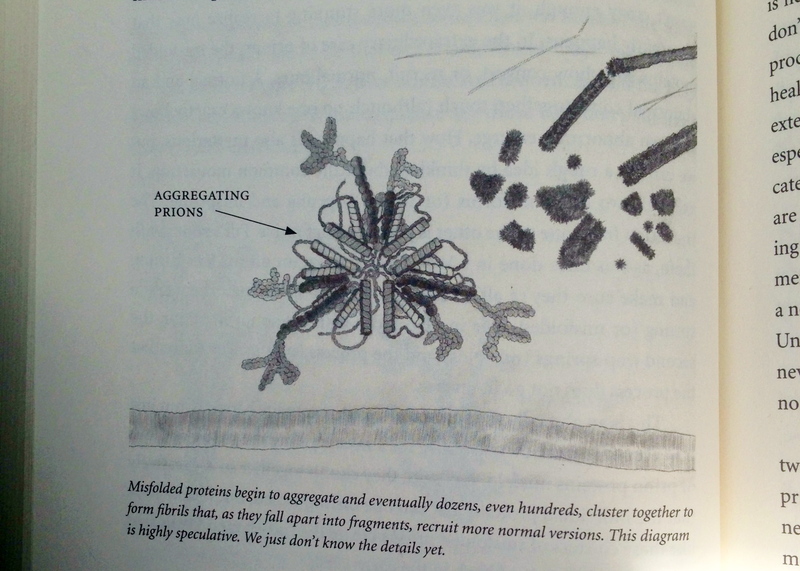 The book eventually discusses other diseases that, while not infectious, do involve misfolded proteins; including amyotrophic lateral sclerosis (Lou Gehrig’s), Parkinson’s disease, chronic traumatic encephalopathy (“punch drunk”) and Alzheimer’s disease. How better understanding prion disease relates to Parkinson’s disease is in the misfolded alpha-synuclein protein deposits that clump together to form lewy bodies. These invading misfolded proteins have a long incubation period (similar to prion disease), where it can be anywhere from 5-30 years before Parkinson’s symptoms even develop. Lewy bodies first accumulate in the nerves of the gut, travel in the spinal cord before spreading to the lower brain (substantia nigra = when symptoms develop) and eventually to cerebral cortex (which may cause dementia). This migration is thought to support the environmental theory of Parkinson’s and paralleled how cow’s who developed Mad Cow Disease ate infected meat and bone meal, which travelled from their stomach to their brain. 3) possibilities of stabilize proteins to make them resistent to midfolding, which may halt/reverse disease progression. if you can get past the cannibalism and infected animals (sheep, cows, deer), it really tells the story of how science begins to understand disease, proteins, DNA, outbreaks, and neurodegenerative conditions. much love. 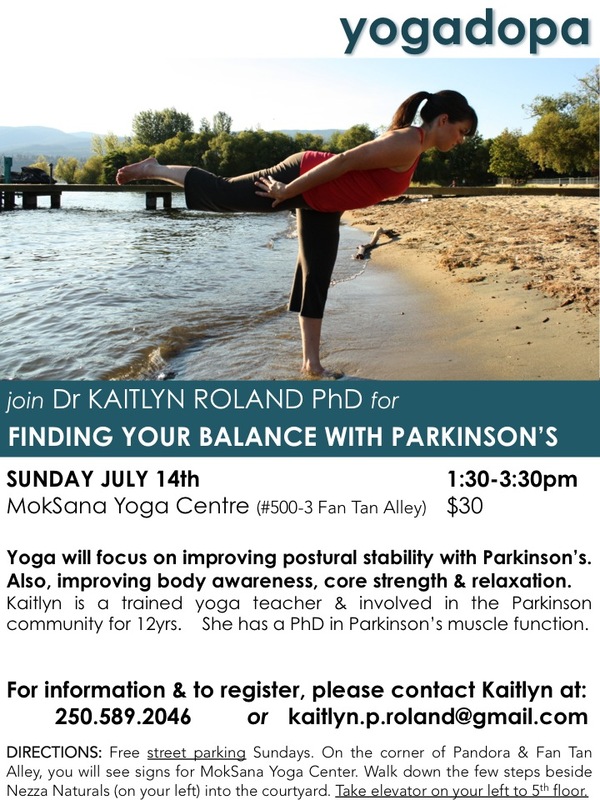 … don’t forget Victoria Parkinson’s Yogi’s, THIS SUNDAY is my next yoga for Parkinson’s workshop! 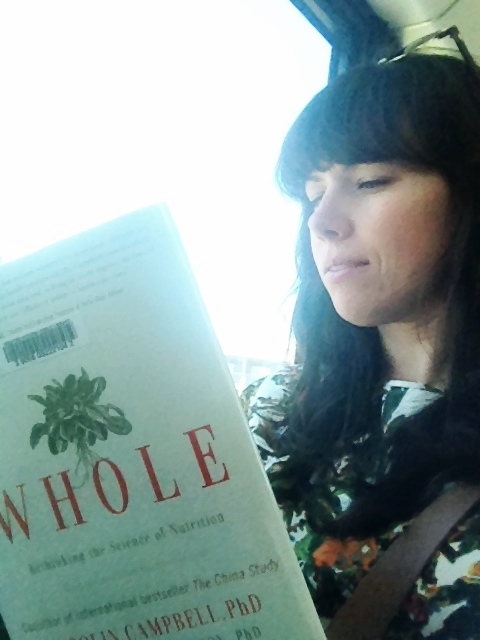 **For the rest of the months of July and August, check out my weekly blog posts (Wednesdays) reviewing some of favourite summer books … on yoga, nutrition, dharma, neurodegenerative diseases, etc. Happy Summer Reading! much love. Dr. Burchiel, in the latest volume of The Journal of Neurosurgery (June 2013), reports recent successes in Deep Brain Stimulation (DBS) where 60 patients are asleep during the surgery, instead of awake under local anaesthetics. DBS surgery was first developed in France in 1987. Dr. Burchiel was the first surgeon in North America to perform the surgery in 1991. It wasn’t until 2002 that the surgery was approved for tremors associated with parkinson’s disease. During DBS, thin wire electrodes are implanted into a specific area of the brain, and are connected to something like a pacemaker implanted in the chest. 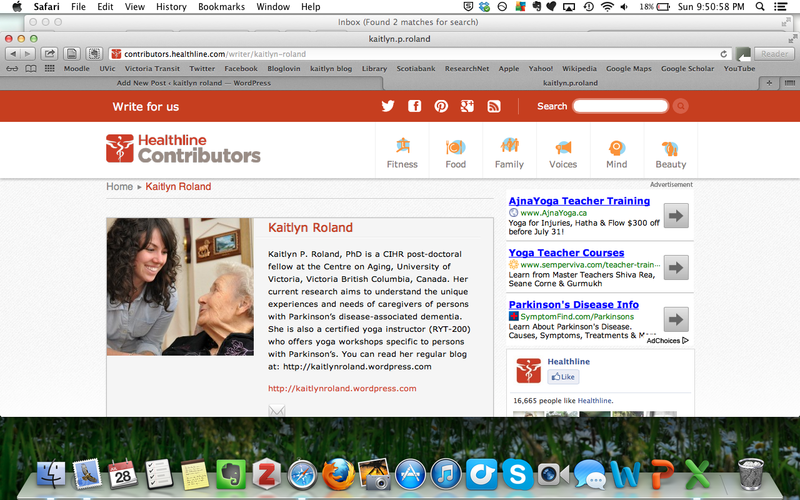 The system then stimulates the brain and relieves some of the parkinsonian symptoms. Typically, DBS patients are awake during the 4-6 hour surgery. This allowed surgeons to monitor symptoms and get feedback about electrode placement. These new technique proposed by Dr. Burchiel and colleagues uses MRI of the patient’s brain before the surgery and CT scans during the surgery to precisely place the electrodes in the brain. This may extend the benefits of DBS to a greater proportion of the Parkinson’s patient population, who may have been unwilling to undergo the lengthy surgery awake. … have you had any experiences with DBS? or suffer any fears of the procedure (being AWAKE, OFF-meds!)? I’d love to hear your thoughts, and if this new technique changes your ideas on DBS! much love. PS Have you seen this BBS video with a guy playing guitar during his DBS? VERY COOL!